Dirt bikes may seem like a fun ride for your kids and both younger children and teens may be eager for the freedom and adventure that a dirt bike seems to bring. However, dirt bikes can also be extremely dangerous, especially if they are operated by inexperienced or under-aged drivers. Our Watertown personal injury attorneys want to warn all parents of the potential risk of dirt bike accidents. Before allowing your child on a dirt bike as a driver or passenger, it is important to understand the dangers and to have a talk with your child about proper riding behavior and safety measures. With their quickness and with the limited protection they provide in the event of an accident, dirt bikes are inherently dangerous by nature. Tragically, however, a recent accident in Massachusetts underscores just how risky dirt bikes can be. In this accident, reported by Boston 7 News WHDH, a 14-year-old boy was killed. The deadly accident happened when the 14-year-old was out riding dirt bikes with his father and his 11-year-old brother. The victim collided with another off-road vehicle at around 2:00 P.M. on a Saturday afternoon. The vehicles collided head-on near a cranberry bog. The 40-year-old driver of the off-road vehicle said he was going to get help but unfortunately never returned. The father of the deceased victim tried to save his son’s life, but was unsuccessful. As this tragic accident shows, dirt bike accidents can happen any time and anywhere. This young man who was killed was with his father and brother and it is not clear yet whether the young dirt bike rider or the older man who hit him was criminally negligent or unreasonably careless in any way. The only conclusive facts thus far in the accident are that the dirt bike and other off-road vehicle collided and that death and injury resulted. If the driver involved in the dirt bike accident who hit the young victim is found to have been negligent, then it is possible that the family members of the deceased could file a civil lawsuit. The success of a lawsuit will depend upon whether the 40-year-old was unreasonably careless in a way that led to the young victim’s death. The property owner where the accident occurred may also face liability. Of course, no amount of money will ever bring back the loss of a child. To help avoid this type of tragedy, parents should think carefully before giving a dirt bike to a young teen, especially one who is not yet old enough to legally drive. If your child does use a dirt bike, it is important to have clear rules regarding speed and regarding when and where the bike can be ridden. Crowded or well-populated roads should be avoided, as should busy times when there are more likely to be vehicles both on the roads and off-roading. By making clear rules with your child, monitoring dirt bike behavior and supervising, you can reduce the risk of a dirt bike accident. 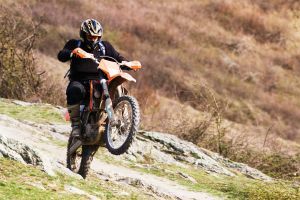 Of course, the best way to avoid this type of accident may be to prevent your child from driving a dirt bike until he or she is legally able to drive and has proven he or she can safely operate a dirt bike. Even then, however, your child is always at risk of falling victim to an accident caused by someone else being negligent. Defective equipment may also contribute to an accident or exacerbate injuries. If you or a loved one has been involved in a personal injury accident in the Greater Boston area, contact the Law Offices of Jeffrey S. Glassman, LLC for a free consultation to discuss your claim. Call 1-877-617-5333.